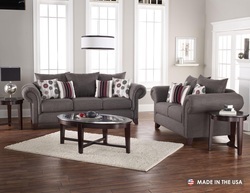 The Jackson living room furniture collection is one of simplified beauty and transitional charm. Designed to give off an urban loft feel with a side-style of traditional fashion, this upholstered furniture set features thick rolled arms and toss pillow backs with slender wood feet and a cool grey upholstery. Made in America by a US manufacturer, this collection features a solid wood construction for strength and durability with solid wood feet and reversible seat cushions for longevity of the piece. Comprised of a sofa and loveseat with coordinating tables, the American made Jackson furniture collection creates an urban loft aura with a traditional touch.